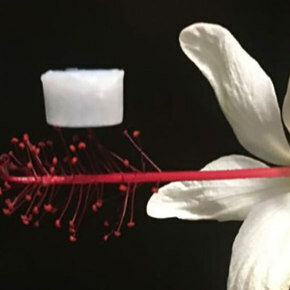 A sturdy ceramic aerogel able to withstand extreme temperatures could be used as an insulation for spaceships. Developed by a team from UCLA, the aerogel consists of thin layers of boron nitride arranged in a hexagonal pattern. Instead of expanding when heated, the aerogel contracts perpendicularly to the direction it is being compressed, allowing it to be much more flexible than its counterparts. The aerogel can also return to its original shape after being compressed to five percent of its volume.